Located on Mexico's Yucatan Peninsula, Progreso provides an entryway to some of the most well-known Mayan historical sites, including Chichen Itza (100 miles away) and Uxmal (71 miles) plus more than 2,000 others in the Yucatan. 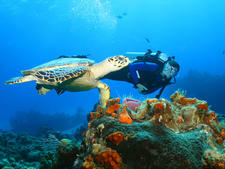 The nearest of these is Dzibilchaltun (16 miles), which includes a cenote (cave) where you can swim. 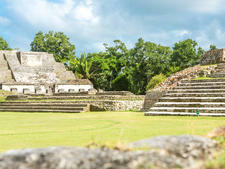 It is also often double-billed as a port with Merida, a city about an hour south. 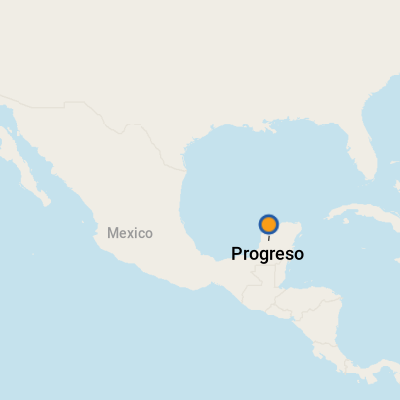 Progreso began its life as a port town in 1871 and has continued to grow over the decades -- particularly after a 4-mile-long pier was installed in 1989 -- but it's not the bustling port that passengers will see throughout other parts of the Caribbean and Mexico. In fact, aside from the throngs of out-of-town vendors that converge when a cruise ship is in port once or twice a week, it can be pretty sleepy. The city center of Progreso is about 5 miles long by 10 blocks and encompasses the Malecon ocean promenade; a small marketplace, or mercado; and the still-active 1893 lighthouse, Faro de Puerto Progreso (the inside is not accessible). A tour of Progreso won't take more than 45 minutes, and after that: la playa (the beach!). Central stop for ruins or a relaxing beach break with great prices on food and drink. The beach tends to swarm with vendors; few offerings in the city center. If you're not traveling elsewhere from here, set expectations for a low-key port. After you disembark your ship, you'll arrive at the "outer realm" of tourist shops and duty-free stores located immediately at the cruise terminal. Make your way through these, and you'll find complimentary shuttle buses to transport you across the lengthy pier to the heart of town. Here, you'll find more vendors offering to take you to the ruins, get a massage or tour the city. In the 1800s, the Yucatan Peninsula was one of the richest areas in Mexico, thanks to its sisal production (a type of fiber often used in rugs). You can still see some signs of its former wealth by taking a tour downtown and seeing some of the stately manors held over from that era. While travelers should be mindful of their surroundings, Progreso is a relatively safe port. The U.S. State Department issued a warning for travelers to Mexico in January 2018 due to increased violent crime activity in the country. Travelers to Yucatan were encouraged to "exercise increased caution." On Foot: Progreso is easy to navigate on foot, given the relatively limited number of attractions and the size of the port itself. Getting to the beach from the shuttle drop-off station is less than a 10-minute walk. Taxi: Taxis and tourist buses are widely available, both right at the ship and near the Malecon where the free shuttle drops off cruise passengers. The fare to get to Merida is approximately $10 each way. The peso is the official currency of Mexico (visit www.xe.com to get current exchange rates), but U.S. dollars or euros are widely accepted in this tourist port. There are few ATMs or banks right in port within a four-block radius of the Malecon (and many more in Merida). Keep in mind that if you pay in dollars, you might receive change back in pesos (rather than dollars) -- ask first if this is a concern. Most major stores and restaurants accept credit cards, but cash is usually preferred, especially at mom-and-pop locales. Again, inquire in advance so you know before your bill arrives. You won't have a hard time if you only speak English here, but it's polite if you can throw in a Spanish greeting or a simple "Gracias" at the end of your transaction. Cart Snacks: Feel like trying something new? Order up a marquesita from a cart in Progreso or Merida. A marquesita is a kind of filled crepe that combines Edam cheese with your choice of sweet fillings, such as chocolate or jam and topped with a sweet cream. Also, don't be so quick to wave away the beach vendor with a large clear box of fried food hoisted on her shoulders -- that's kibbe, a local delicacy imported here along with the Lebanese immigrants who've settled here. It's a delicious -- if slightly decadent -- beach treat. Xtabentun from the Duty-Free Shops: Ask for a sample of Xtabentun (pronounced: "Ish-ta-ben-TOON") to try a locally produced liqueur made from the bark of an anise tree. (If you're a licorice lover, you'll like it.) It's sold at duty-free shops throughout this region of Mexico. If you're sticking close to the port in Progreso, your shopping options are fairly limited to the souvenir shops at the terminal, the shops along the Malecon (filled with souvenir shops, restaurants, bars and pharmacies), plus the street and beach vendors. You'll find the best prices on souvenirs in the shops in this area, as well as in downtown Merida. Haggling is both an expectation and an artform -- so feel free to negotiate for the best price. If you want to get a glimpse of a more authentic experience outside of the souvenir shops, go to the mercado at the heart of town to peruse the produce, meats and other items on offer to locals. 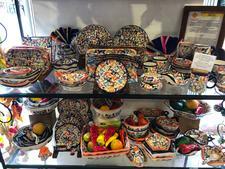 Authentic souvenirs from the Yucatan Peninsula include a guayabera -- a pleated cotton or linen men's shirt --or a huipil -- a traditional embroidered women's blouse or dress -- both widely available in stores throughout the peninsula.